Back in June 2016, I reported on a relatively new phenomenon in SaaS: the rise of pricing transparency. We investigated pricing practices at 87 of the largest public and private software-as-a-service (SaaS) companies in the US. That study revealed that more than half of private SaaS unicorns (55%) were publishing their pricing online for the world to see, as opposed to only 28% of public SaaS companies. These SaaS unicorns seemed to embrace a new ethos. Rather than being opaque and hard to do business with, like enterprise software companies of yesteryear, the SaaS company of the future had nothing to hide. They would be friendlier to their buyers, who often didn’t want to waste cycles talking to a sales rep just to get basic pricing information about a product. Well, the pendulum has swung back the other direction. I revisited the private SaaS unicorns that I had analyzed back in June 2016, companies that include InsideSales.com, Docker, Slack, DocuSign and Dropbox, and found that today, 47% publish their pricing, down slightly from 55% a year and a half ago. No companies that had previously hid their pricing shifted towards transparency in the most recent study. I also tracked down data on new SaaS unicorns, companies like Zuora and GitHub, that reached a billion dollar valuation after our original study. 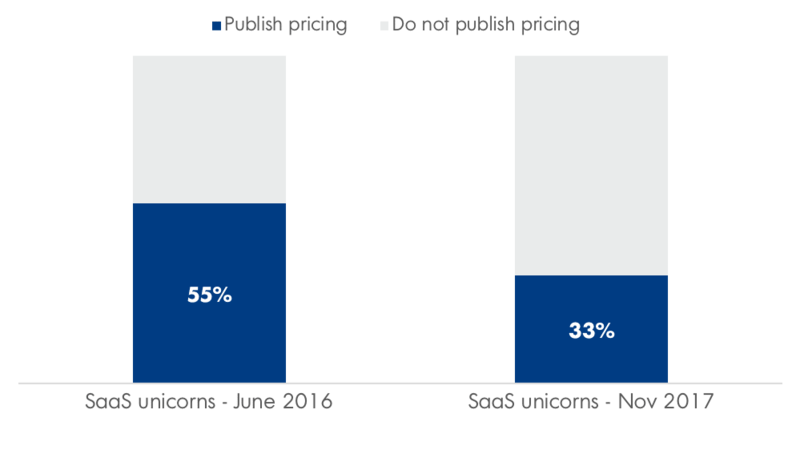 Of these new unicorns, a measly 21% publish pricing – a figure lower than what I had seen for publicly traded companies back in 2016. Taken together, just 33% of SaaS unicorns of the 66 we studied currently publish their pricing. 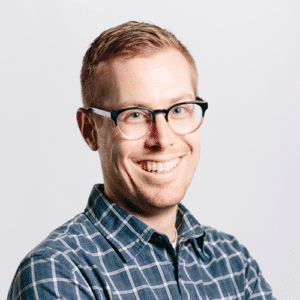 InsideSales.com – a company I highlighted in my 2016 post – has actually reversed its policies around pricing transparency. The company began showcasing their packages and pricing on their website in 2015 and kept it visible through 2016. ( Those packages and price points are archived through the Wayback Machine at web.archive.org if you’re interested). Now, not only do they not release pricing information, they put up an onerous form to even request it. The form includes a whopping 10 fields, including email, phone number, company size, number of sales reps, title, department and CRM. There are a few reasons for the shift we’re seeing around pricing transparency. The first is secular in nature. The new unicorns that have emerged over the past year and a half over-index in verticals like Cybersecurity (Crowdstrike, Cylance, CloudFlare) and Analytics (Uptake, Medallia, Rubrik), as opposed to SaaS Apps or SMB solutions. These verticals haven’t been known for transparency given that they typically target large enterprises and have complex inputs to calculate pricing. The second main reason has to do with the fact that many companies often see it as in their best interest to be as private as possible. That way they don’t have to worry as much about competitors seeing their pricing, and then undercutting them to win a deal. It also means they don’t have to keep their pricing simple and straightforward, since it won’t be shared without the aid of a sales rep. Keeping pricing under wraps provides for the flexibility to change prices and packages without as much fear of having to re-price their base of customers. Thirdly, many sales leaders believe that they have a better chance to win a deal if they lead with value as opposed to price. A buyer might get sticker shock if they see pricing online out of context. But if the sales team has a chance to showcase the capabilities and get more executive decision makers involved, perhaps they could catalyze a deal from an initially skeptical buyer. These are all fair reasons, especially for companies that sell into large enterprises with long sales cycles. But I believe companies have gone too far, and in the process have hurt both buyers as well as themselves. In 2018 I hope to see a renewed emphasis on transparency. Here’s why. SaaS companies can’t hide anymore: Buyers are almost always going to search “insert category” and “cost” or “price.” If they can’t find that information on a company’s site, they will go elsewhere. The emergence of third party review sites like G2 Crowd, Capterra, Quora and Siftery increasingly put pricing information into the public domain. Wouldn’t you rather showcase that information on your own terms as opposed to being cut out of the buyer journey? SaaS companies need to reorient their brands around transparency: Buyers are doing more and more research about vendors before they get in touch with a sales rep. The role of the modern sales rep is going to be more similar to that of an expert or consultant, rather than someone “selling” their products at all costs. To win in this environment, SaaS companies need to establish brands that emphasize trust, helpfulness, and, you guessed it, transparency. SaaS companies need to accelerate their sales cycles: Most SaaS startups with an inside sales model can’t waste precious resources on less serious, unqualified prospects or those only looking to be educated on the market. Wasted sales and marketing resources leads to poor unit economics, making it hard for a company to attract future funding. Transparent pricing acts as an important qualification gate that allows sales reps to focus their time on serious buyers. Do you publish your pricing? Why or why not? We’d love to hear from you and learn about your results! Let us know if the comments or tweet to @poyark and @openviewventure.